At the beginning of May, Aquatech Amsterdam announced a complete sell-out. Setting a new record, the show already attracted over 900 exhibitors and started a waiting list 6 months before the show, while creatively looking at options to add more square meters to the already fully filled halls. The success is primarily defined by the international reputation the show acquired since its first edition in 1964. It is the oldest and the largest trade show on water technology in the world and companies from around the world are eager to get on board. With over 70% of visitors flying and driving in from other countries, Aquatech has a truly global flavour. The majority originate from Europe but interest from Asia, USA and the Middle East is rising rapidly. Visiting the RAI is very easy when flying in. Schiphol international Airport is just 15 from the venue by train and the Aquatech organisers have arranged a free first class train ticket from this airport, to be ordered in the free visitor registration module. For the first time, Aquatech will be doing guided tours and a matchmaking service. Visitors with a specific interest in Circular Economy, Smart Cities, Urban Resilience and/or Innovation can join guided tours of the show tailored to these interests. Another new additional service is matchmaking. Visitors can prearrange networking and business appointments with exhibitors, as well as other visitors and speakers, based on interests and profile. For the fourth time, Aquatech is part of the Amsterdam International Water Week (AIWW) a divers platform for water professionals around the world including a conference, a young professionals programme, social events and, new this year, Floodex Europe. This last show covers water level management and flood control. This subject has demanded more attention and is now covered in a separate hall. 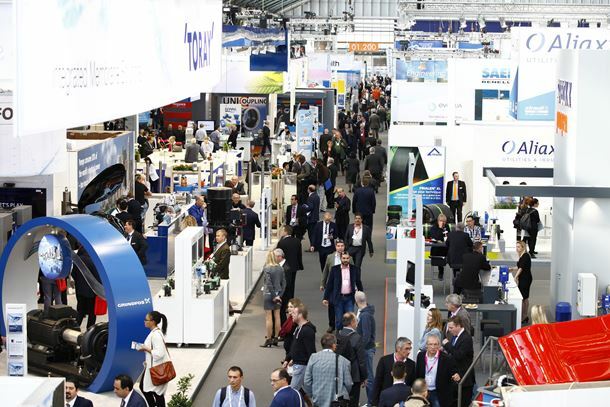 Everything is gearing up for a spectacular week starting October 30th with the opening at the end of the day and the start of Aquatech Amsterdam and Floodex Europe on the 31st.